Anyone who’s ever experienced a light installation by James Turrell knows that the right light can make a space seem infinite. Our perception of architecture changes with the temperature of the light, the time of day and the weather. 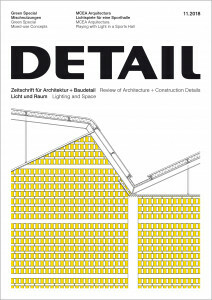 Each location has its own special light, as demonstrated by the projects in this issue of Detail. In Puig d’en Valls, sunlight in the blue-floored sports centre by MCEA Arquitectura creates a completely different atmosphere than in the bright wooden cabin in Jevnaker by Mork-Ulnes Architects. In both cases, the architects accentuated the site-specific lighting conditions through their material selection and arrangement of building openings. The pavilion in Park Vijversburg in the Netherlands brings together interior and exterior space in a surprising way. Studio Maks and Junya Ishigami used column-free, load-bearing glass facades for maximum transparency and a mysterious play of reflections and views. In the heart of London, Maggie’s Centre Barts by Steven Holl and jmarchitects is much more introverted. Its translucent glass skin fills rooms with diffuse light, while obscuring views almost entirely. Fink + Jocher also created a world in itself with their chapel at the Ordinariate of the Arch­bishop in Munich. Reminiscent of James Turrell’s Skyspaces, the oval-shaped prayer hall is proof that light is a material that can be sculpted. The true nature of light, according to Tadao Ando, cannot be found in light alone, but in its interplay with darkness. Especially in large cities, humans and nature are suffering from light pollution. Anneke Bokern spoke with Roger Narboni to find out how urban lighting master plans can provide a way out of this dilemma. Mathias Wambsganss and Johannes Zauner look at how light and darkness affect our health and how health-oriented lighting design must consider factors such as time and lighting types. Our special Detail green section examines mixed-­use urban structures. Two very different new buildings by David Chipperfield Architects and Dominique Coulon & Associés show how architecture can go beyond monofunctional spatial concepts.